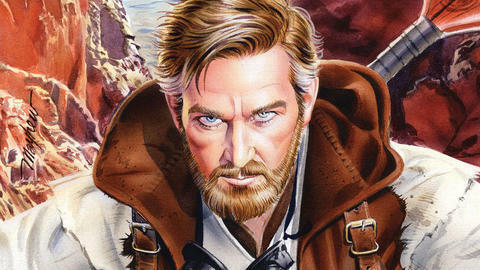 Obi-Wan takes center stage as we continue to look at Luke’s farm life! As much fun as a day in the life of farmboy Luke Skywalker may have been to see in Marvel’s 1970s Star Wars comics, writer Jason Aaron has taken the idea and run with it for his current STAR WARS series. 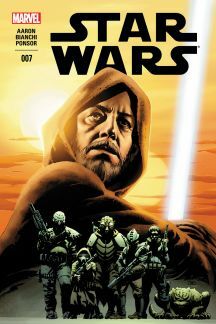 So far, three issues—#7, #15, and #20—have brought Obi-Wan Kenobi’s journal entries from Tatooine to life, as we experience his protection of Luke and the Lars family moisture farm from the Jedi Master’s perspective. At times, this presents as simple as watching young Luke crash his T-16 skyhopper at Beggar’s Canyon—womp rat cameos included! Obi-Wan jumps into action against Jabba’s thugs and Tusken Raiders. And without spoiling too much, Luke himself does some dramatic rescuing of his own! While getting a solid taste of Luke’s craving for adventure and excitement at such a young age proves fascinating enough, Obi-Wan’s own actions and introspection really make these issues stand out as modern classics. Aaron takes us inside Obi-Wan’s head, providing a better understanding not only of how seriously he takes his role of protecting Luke, but also of his struggle to balance assisting Tatooine citizens in peril with keeping a low profile—which, as his showdown with Wookiee bounty hunter Black Krrsantan attests, doesn’t always work out so well for him. Obi-Wan even has to deal with Uncle Owen yapping at him, saying he doesn’t need his help. Who ever said life as a secluded hermit would be peaceful?